Our Abpromise guarantee covers the use of ab8805 in the following tested applications. WB 1/500. Detects a band of approximately 60 kDa (predicted molecular weight: 56 kDa). The Akt antibody (ab8805) is used at 1/80 on cultured neonatal rat cardiomyocytes that express a nuclear-targeted Akt construct. 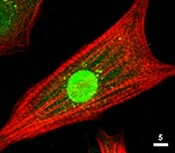 The green is Akt antibody, the red is Texas-red™ phalloidin that labels actin filaments. 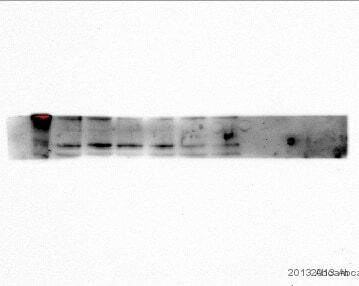 Akt antibody (ab8805) used at 1/1000 on formalin-fixed paraffin embedded tissue. Publishing research using ab8805? Please let us know so that we can cite the reference in this datasheet. One more question… do you sell positive/negative control slides or cells for these antibodies? I can’t seem to find them on the website. 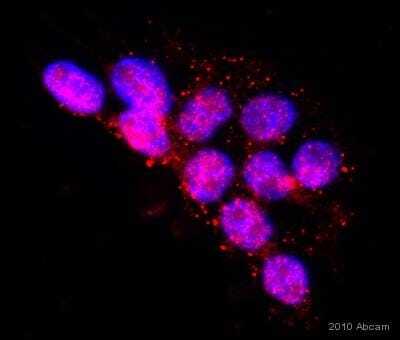 For the pan-Akt antibody we have ab4702, colon tumor slides, and ab139513 which is NIH3T3 cell lysate. 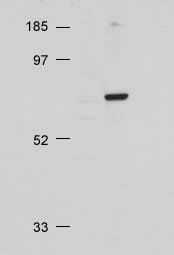 The for the Akt1 pS473 antibody ab66138 we have human breast cancer tissue slides ab46961, and TNF treated NIH3T3 lysate ab14877. We are continually trying to add controls to our catalog but sometimes they are harder to find so please feel free to contact us should you ever have difficulty finding a product! Thanks for review this technical inquiry and the questions. Please find below our answers to the questions that you asked, hope it to be of some assistant. Please feel free let me know if there is further question. Thanks a lot. 1 The samples in each lane were the same 2 The proteins were from the same animal-rat 3 The concentration of protein was the same--50ug 4 I don't have whole gel imagines for any of them, we tried to save the antibodies. 5. Our PVDF membranes had already been prewetted in methanol before use. As each lane was running the same sample we should expect to see a uniform pattern for each. However in the image provided this is definitly not true. This issue is most commonly found with a bad gel. Sometimes they may go bad if stored incorrectly or for too long but most often the cause is that is is run at too high a voltage or with running buffers that have gone bad. It also seems that an 8% gel may be a less than ideal choice for proteins of this size. I recommend 12% SDS-PAGE for these. I would suggest using new or commercial gels of 12%, running with fresh running buffers at a lower voltage. I would also suggest using BSA 3% in PBS + 0.1% Tween-20 as a blocking buffer for ab8805 and ab66127 and prehaps a casein based blocking buffer such as ab64224https://www.abcam.com/Protein-Block-ab64226.htmlfor use with the phospho-S473 AKT1 antibody (ab66138). I am sorry to hear you have been experiencing problems with one of our antibodies. The quality of our products is important to us and I would like to reassure you that we investigate all customer complaints. I have had the opportunity to review the information and images that you have provided and would like to ask a few questions and offer some suggestions that may help. These products are covered by our Abpromise guarantee.If we cannot remedy this issue and this is a product that you have purchased within the last six months, we will replace or refund it under our Abpromise guarantee, as you are using it according to specifications listed on our datasheet. In regards each image, were the samples in each lane the same? Were they different animals, protein concentration? 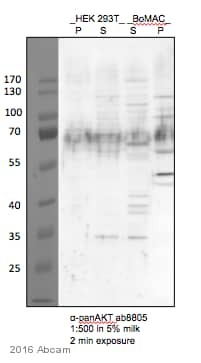 These blots in images for ab8805 and ab66138 appear to have not run through and the gel in the image for ab66127 look like it may have deformed during running. Do you happen to have whole gel images for any of these? The quality of western blots using PVDF membranes will be greatly increased by pre-wetting the membrane in methanol.If this is not something that you have already dome I would suggest doing this. PVDF is hydrophobic and therefore should be prewet in methanol before it is used. Wet the membrane in methanol for 15 seconds. Membrane should uniformly change from opaque to semi-transparent. Carefully place the membrane in ultrapure water and soak for 2 minutes. Then carefully place the membrane in transfer buffer and let equilibrate for at least 5 minutes. You should get a cleaner signal with less antibody when performing this. Customer requested the information regarding manual quantification of antibody signal in IHC-P. Thank you for contacting us. I would say that this sort of experiment is very-very tricky. We unfortunately do not have any protocol available at the moment for manually IHC staining quantification with antibodies. I would suggest ploughing through the publications and finding if there are scientists who are using similar kind of method. http://www.histochem.org/archives/photoshop.pdf http://www.ncbi.nlm.nih.gov/pmc/articles/PMC1810239/ http://www.ncbi.nlm.nih.gov/pubmed/21370029 Have a look at these articles and check which one could help you to set up the experiment. I hope this will help.